Eco-friendly cleaning is made easily possible with the Advance Advenger equipped with the EcoFlex™ System. It makes anything from eco-friendly cleaning to deep scrubbing possible. Allowing you to customize the scrubber to your needs. Nothing is sacrificed with the Advenger, it delivers green cleaning with excellent performance. The onboard detergent dispenser in the optional EcoFlex™ System is what allows the user to adjust to different cleaning modes. It gives the operator the ability to use any detergent or to clean with just water. Once the user chooses their settings, the scrubber automatically adjusts to the specified ratio, dispenses it with plain water, and applies it to the floor. This eliminates the need for a solution tank, minimizing wasted detergent and water. The ultra-low flow dispensing reduces water use by 70%. When more power is needed for more soiled area, the “burst of power” feature is perfect because it momentarily increases solution flow, brush pressure, and detergent strength. The Advenger provides just the right amount of cleaning power for any area while being green and cost effective. 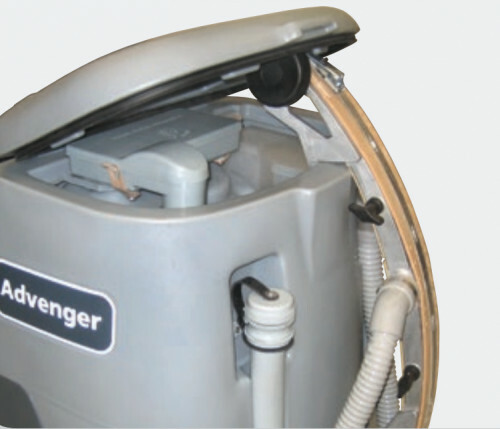 The Advenger has a large recovery tank lid that gives you the ability to see the entire tank when cleaning it out. The lid utilizes press in gaskets that makes gasket replacement a breeze and ensures a great seal. The debris catch bin inside the tank reduces the chance of a clogged drain hose by collecting the debris before it can settle to the bottom of the recovery tank. The control system on the Advenger is very intuitive as each button has an icon that clearly indicates its function. 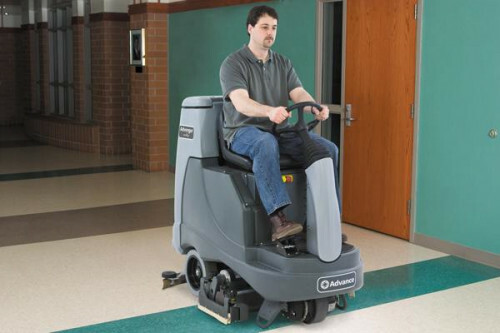 One-Touch™ operation is utilized on this scrubber and steering system is very ergonomic for the operator. Forward and reverse functionality is incorporated into the pedal with automatic braking.